The secret to the success of the Blue Crown Spark Plug vehicles was that the front wheel drive pulled the car around the corners vs. pushing the rear wheels. Some of the cars fiercest competition came from the Novi Governor race cars, which were also front wheel drive, but the supercharged V-8’s were simply too powerful. In 1947, the very first two Meyer & Drake 270cid “Offy’s” produced went to Lou Moore for his brand new Blue Crown Spark Plug Specials race team, which were designed by the famous Draftsman Leo Goossen during the war. Reputably “secretive,” Moore’s Offenhauser powerplants were presumed to be of two valves per cylinder design, with 13:1 compression and running 115 octane “Av-gas” Aviation grade petrol. As Moore’s winning philosophy centered on fuel economy; utilizing the time honoured philosophy simply known as making the least amount of pit stops possible, with Moore’s strategy consisting of running the race on a single pit stop! Meanwhile Joe Lencki was back again with his Lencki Specials, as this year saw Lencki’s mounts be entered under the Preston Tucker Partners banner, with the addition of a new Myron Stevens chassis joining the mix. Emil Andres and newcomer Charlie Van Aker were his drivers behind the keyboards, with Rookie Van Aker and Andres qualifying 24th and 30th respectively. Andres was classified 13th after his No. 3 Lencki/Lencki chassis retired on lap 149 with an uncooperative oil line, while Van Aker crashed the No. 44 Stevens/Lencki chassis out on lap 24 and was classified 29th for the non-typical 30 car field. 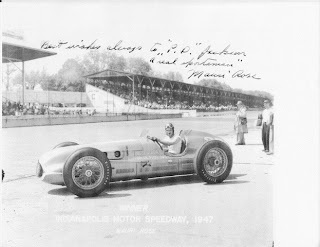 Moore’s two Blue Crown drivers that May were the 1941 Indy 500 co-winner Mauri Rose, with Indy 500 Rookie Bill Holland as his teammate. Rose qualified his No. 27 racecar third, while Holland rolled off from eighth place aboard the No. 16. After pole sitter Bergere had led the first 23 laps, the rest of the race would be dominated by the two Blue Crown Spark Plug Specials leading the rest of the way, as Holland would lead a total of 143 laps. Lou Moore once again entered his two front drive Offy’s for Mauri Rose and Bill Holland, yet the spotlight was firmly affixed upon the shrieking wail of the Novi, which had seem much controversy leading up to the races start. As previous year’s pilot Cliff Bergere had declared the car unsafe and retired, with his last moment replacement being Ralph Hepburn, who at 52 years old would sadly lose his life in a practice session after having run a lap at 128mph. 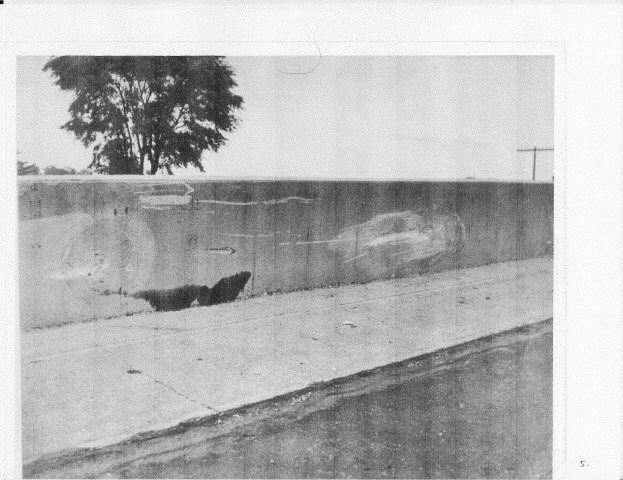 Chet Miller then resigned from driving the second Novi and thus stepping into the breach was Dennis “Duke” Nalon, who qualified the car in 11th place after his last minute substitution, albeit his speed having been faster then pole winner Rex Mays, with his first flying lap being just a tick over 134 miles per hour. Joe Lencki returned once again in what would ultimately be his last race at the Speedway during the front engine era, before a long hiatus, when he’d attempt a comeback in 1960, having Meyer & Drake produce another 265cid six cylinder engine for him, which Lencki hoped to contest the 1962 Indy 500 with a modern Roadster. Yet, his sponsorship fell thru and his final attempt at the Speedway in 1963 saw the racecar fail to qualify. Lencki entered the now long in the tooth front engine six cylinder chassis, with Ronnie Householder and "Cowboy" O'Rourke as his drivers, but both failed to qualify. On the opposite end of the spectrum, Rex Mays pole winning Bowes Seal Fast Kurtis/Winfield set the pace at 130.570mph, vs. Nalon’s electrifying four lap average of 131.600mph, while the Blue Crown Spark Plug Specials of Bill Holland and Mauri Rose qualified second and third respectively. Meanwhile starting in fourth place was a third Deidt/Offenhauser front wheel drive chassis, having been purchased by Superior Oil magnate Howard Peck and driven by Jimmy Jackson. And although Mays took off like a rocket at the start of the race, he was forced out of the race on lap 129 with a fuel leak, While the stiffest competition for victory came from Duke Nalon and the Novi, while Rose and Holland once again steadily held station at the front of the pack by running Moore’s traditional one stop strategy. For the 1949 Indy 500, Lou Moore increase his team’s entry to three cars, with the two front drive Offy’s once again being reserved for Mauri Rose and Bill Holland, while new Blue Crown recruit George Conner was given the wheel of a rear drive Offy that Moore had ordered the previous year for Holland to contest Dirt Track events in. This year’s race would once again see the Novi’s as favourites... With Duke Nalon on pole and new teammate Rex Mays alongside him, as the Novi’s started one – two. And while Nalon took off like a scalded cat and led with ease for the firs 20 laps, a rear axle failure would cause a violent crash in which Nalon would be seriously burned and Mays would retire with engine failure. Next into the lead was Lee Wallard, in the ex-Wilbur Shaw Maserati, but he too fell out and as history has shown time after time, the Speedway always beats its own drum, as it would be second row starter Bill Holland aboard his No. 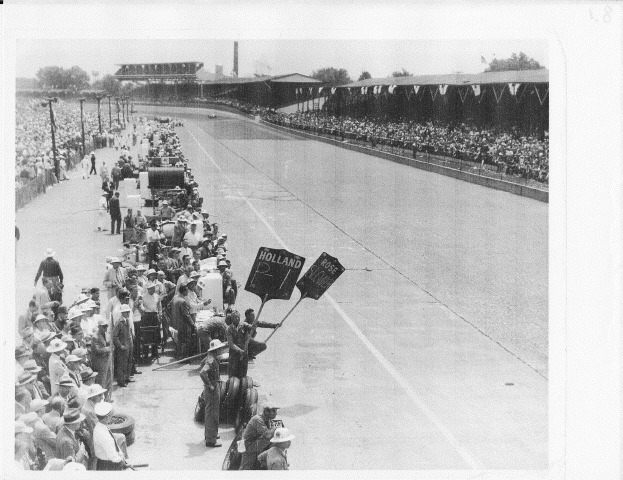 7 racecar winning his first and only Indy 500 for Lou Moore. 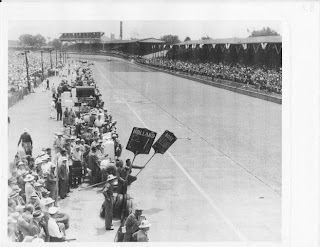 Ironically, towards the end of the event, another “EZY” sign board was displayed around lap 143 while Holland was leading his arch rival (teammate) Mauri Rose by 45 seconds. Yet, this time he was more cautious about backing off, having fallen fowl to this instruction in ’47, slowing down only slightly while Rose continued charging. Thus instead of Rose finishing second, the hard charging exertion caused the magneto strap to wilt under the demands of the impatient Mauri and the No. 3 Blue Crown Special ground to a stop just eight laps short of the finish, (being classified 13th) while rookie Johnny Parsons (Senior) inherited second and Blue Crown debutante Connor’s No. 22 finished in third place. After the race, Moore and Rose reportedly got into a shouting match over Rose’s disrespect for his equipment, and their longstanding partnership came to an end, while Holland said nothing!